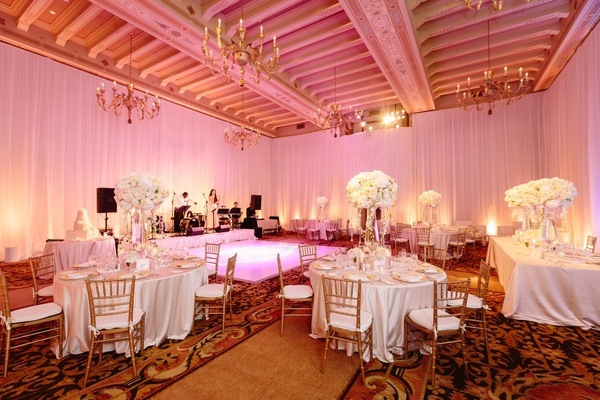 “We began by envisioning a ceremony site that radiated opulence and sophistication,” says wedding planner Ilana Rosenberg of Ilana Ashley Events. 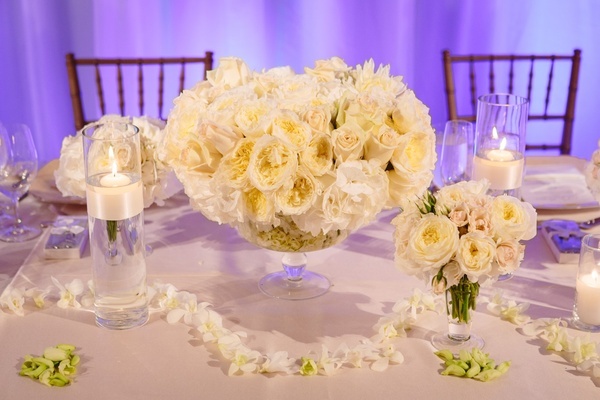 A chuppah with classic white drapery was topped with a variety of cream and blush roses. 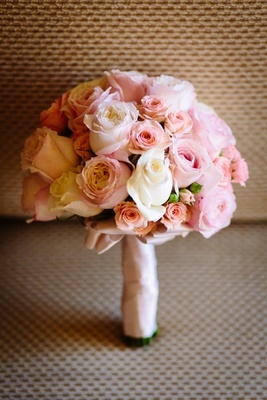 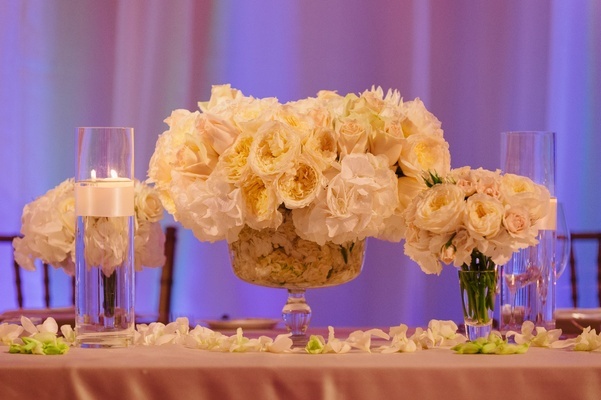 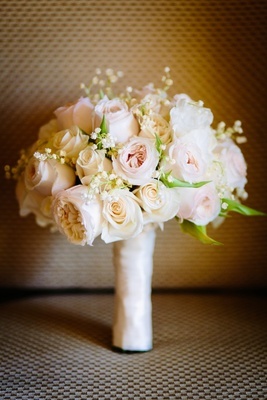 “We selected white roses for their timeless association with weddings, and added in blush-colored blooms to add a sense of sweetness and warmth,” explains Ilana. 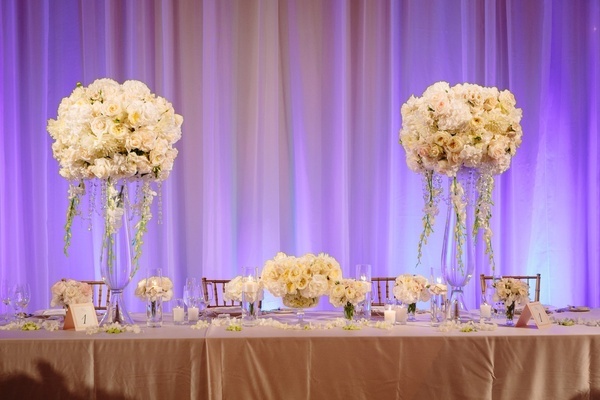 Strings of orchids cascaded behind the couple to create a perfect backdrop for the ceremony. 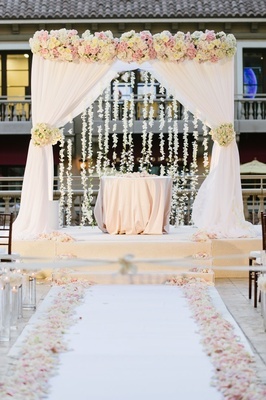 As many Jewish weddings are held after sunset, the chuppah was also photographed beautifully with the night sky. 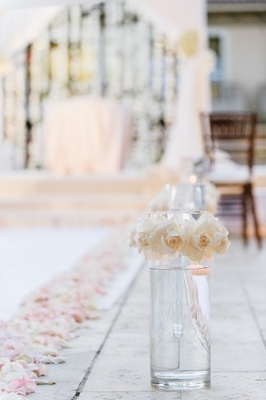 The aisle was lined with rose petals, while tall glass vases with candles and long-stem roses added both height and elegance. 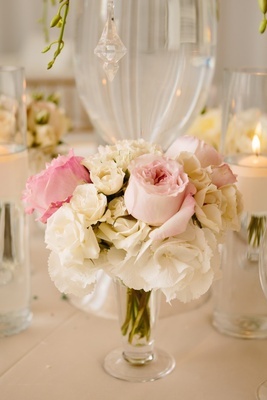 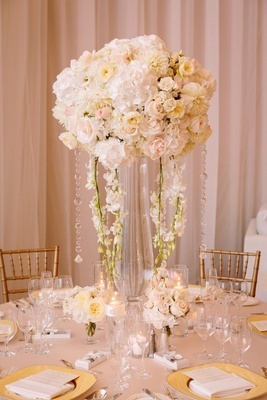 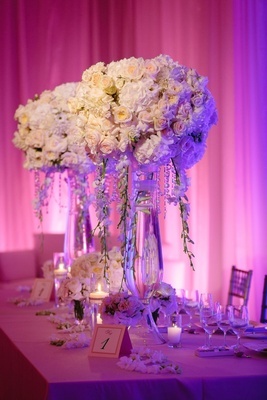 The centerpieces echoed the glass vases from the aisle, and the three-foot-tall teardrop vessels were topped with fluffy arrangements of ivory roses, hydrangeas, mums, and chrysanthemums, with orchids and crystals overflowing towards the table, where a delicate gathering of blush and white blooms encircled the base of the glass. 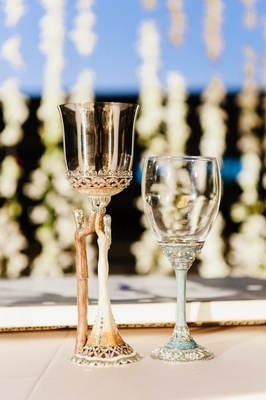 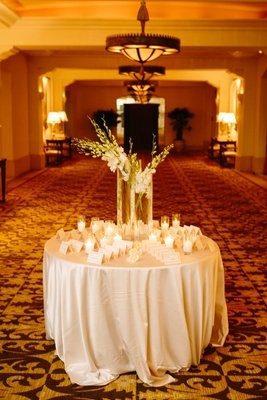 Votive candles allowed light to reflect off the crystals, creating a sparkling effect on the tables. 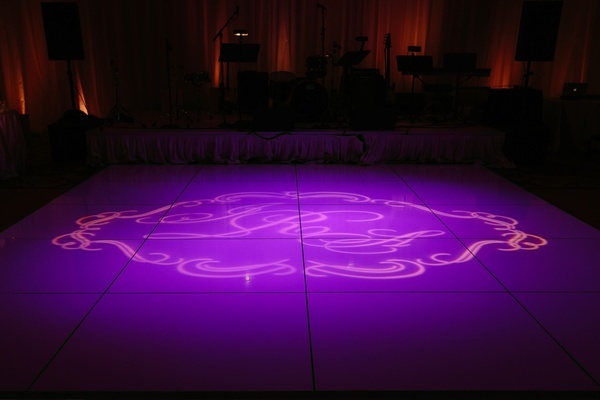 The room was awash in the glow of romantic pink uplighting, and a purple spotlight added a monogram to the dance floor. 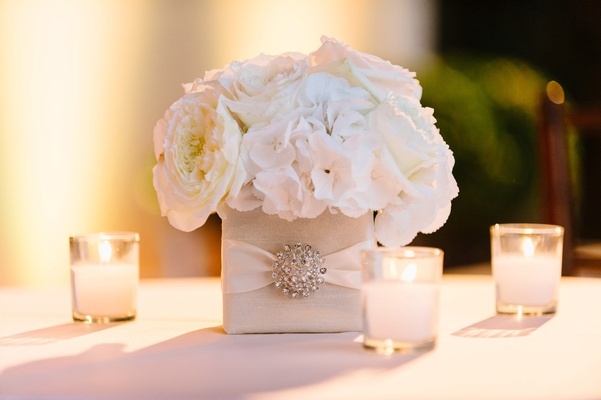 A three-tiered wedding cake with quilted fondant featured edible pearls and delicate sugar roses in order to perfectly complement the lush décor. 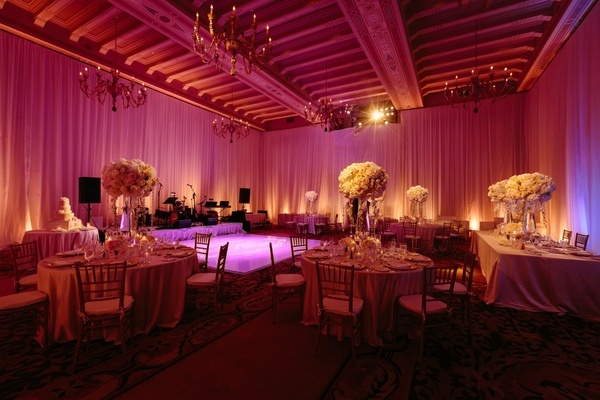 View the elegant décor in the slideshow above!